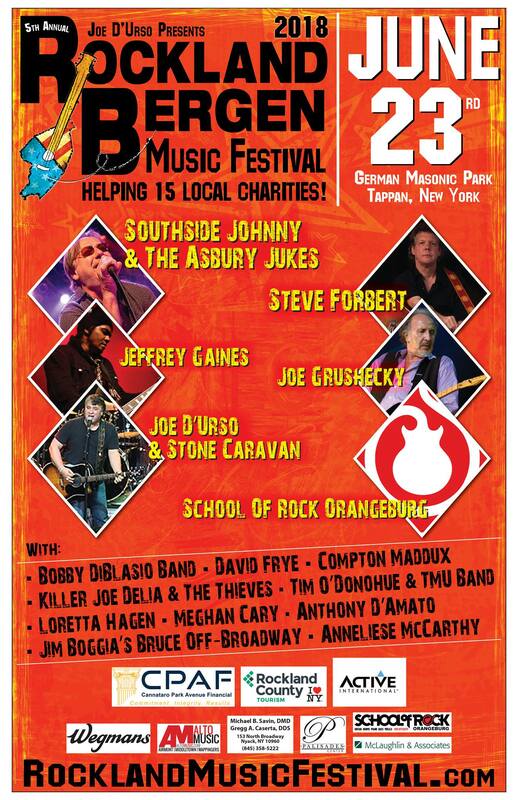 This Friday starts the 5th annual Rockland Bergen Music Festival, a music event that not only brings renowned musical acts to a nearby venue but also uses the opportunity to bring awareness to local charities who support the community. On Saturday, on the outdoor portion of the festival, there will be a Circle of Hope highlighting 15 such local charities. We are honored to be one of the participants. The event was created by Joe D'Urso, a Rockland native son who has taken his Stone Caravan Band to perform across the world. In recognition of his 50th birthday, Joe created the festival and invited all 50 year olds to celebrate by coming for free, a tradition that continues to this day (so if you are born in 1968, this one is for you!) 16 different acts will be performing on two stages on Saturday June 23 at the German Masonic Home from 11-8! Included are Southside Johnny and The Asbury Jukes, Steven Forbert, Joe Grushecky, Jeffrey Gaines, Bruce Off Broadway, Joe D'Urso and the Stone Caravan, and Killer Joe Delia and the Thieves and many more! Information can be found at rocklandmusicfestival.com Please come and support this great event and visit our table with a menagerie of penguins to take home. Is there a coincidence between animals that respond to music by "dancing" (making rhythmic movements) and animals that can imitate sounds? Since there is no evidence that penguins can mimic sounds, the theory is that they probably do not respond to music by dancing, Happy Feet not withstanding.Then again, there's no question that penguins communicate vocally. Penguin colonies are LOUD (although how long depends on the species). Chicks squeak to their parents, mates call to find each other, penguins hiss at skuas and other predators, and occasionally birds just scream and display in the air to defend territory or for no apparently reason, which often sparks nearby penguins to do the same. Based on that, you could probably find music or other noises that would cause penguins to exhibit a behavioral response, perhaps even a positive behavioral response. There you have it, music makes you happy!